The first photos of the 2012 Mercedes C-Class Coupe show an evolution on par with the wagon/sedan up front and one unique difference out back: a Hoffmeister-ish kink. 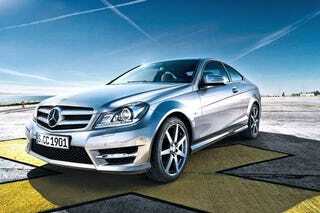 Images of the new C-Class Coupe were leaked by AutoBild and they reveal the interesting C-pillar treatment. Having been used to the long, arched belt-line this is a dramatic and BMW-ish change in an otherwise predictable refresh. The new car will debut sometime in the next few months with the same direct-injection V6 and V8, as well as a turbocharged four-cylinder some time in the future. We can't wait for the wicked Black Series and C63 versions.